Pinkie Pie is a teacher at the School of Friendship, and she loves to show students how to do what she does best! With the 2-in-1 My Little Pony Pinkie Pie Beats and Treats Magical Classroom, pretend Pinkie Pie has fun lessons to share. First, imagine she is teaching students how to bake sweets in the kitchen. Put the pie accessory inside the oven and imagine she’s waiting for her treat. Ding! Hear the timer and pretend the pie is done! Then, flip the set around for music class. Place the guitar accessory on the Pinkie Pie figure and set it on the stage to hear a guitar solo, or put keyboard on the stage to hear some notes. Behind the microphone, kids can press the button and hear her hum a fun tune. 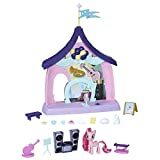 Place another pony figure (sold separately) on stage to pretend they’re jamming — when kids press the button and then place an instrument on the stage, they’ll hear humming and music together!